Access over 2800 digital flashcards focused for the NBDE and your dental school exams on Anatomic Sciences & Histology, anytime anywhere with convenience and accessibility on your iPhone, iPod, iPad and Android Devices! Understand concepts with our picture cards (over 500 pictures). No longer carry heavy flashcards in your back pack. Boost your score while shaving days off your study time. Receive free unlimited updates. Guaranteed to Pass or double your money back! Access over 2200 digital flashcards focused for the NBDE and your dental school exams on Biochemistry & Physiology, anytime anywhere with convenience and accessibility on your iPhone, iPod, iPad and Android Devices! Understand concepts with our picture cards (over 200 pictures). No longer carry heavy flashcards in your back pack. Boost your score while shaving days off your study time. Receive free unlimited updates. Guaranteed to Pass or double your money back! 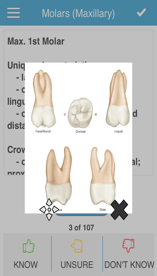 Access over 1500 digital flashcards focused for the NBDE and your dental school exams on Dental Anatomy & Occlusion, anytime anywhere with convenience and accessibility on your iPhone, iPod, iPad and Android Devices! Understand concepts with our picture cards (over 100 pictures). No longer carry heavy flashcards in your back pack. Boost your score while shaving days off your study time. Receive free unlimited updates. Guaranteed to Pass or double your money back! Access over 4100 digital flashcards focused for the NBDE and your dental school exams on Microbiology & Pathology, anytime anywhere with convenience and accessibility on your iPhone, iPod, iPad and Android Devices! Understand concepts with our picture cards (over 130 pictures). No longer carry heavy flashcards in your back pack. Boost your score while shaving days off your study time. Receive free unlimited updates. Guaranteed to Pass or double your money back! Access over 700 digital flashcards focused for the NBDE and your dental school exams on Behavioral Science, anytime anywhere with convenience and accessibility on your iPhone, iPod, iPad and Android Devices! Understand concepts with our picture cards (over 40 pictures). No longer carry heavy flashcards in your back pack. Boost your score while shaving days off your study time. Receive free unlimited updates. Guaranteed to Pass or double your money back! Access over 900 digital flashcards focused for the NBDE and your dental school exams on Dental Health, anytime anywhere with convenience and accessibility on your iPhone, iPod, iPad and Android Devices! Access over 4700 digital flashcards focused for the NBDE and your dental school exams on Endodontics, anytime anywhere with convenience and accessibility on your iPhone, iPod, iPad and Android Devices! Understand concepts with our picture cards (over 350 pictures). No longer carry heavy flashcards in your back pack. Boost your score while shaving days off your study time. Receive free unlimited updates. Guaranteed to Pass or double your money back! 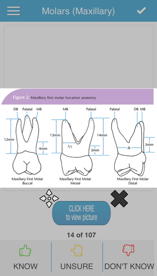 Access over 1000 digital flashcards focused for the NBDE and your dental school exams on Oral Surgery, anytime anywhere with convenience and accessibility on your iPhone, iPod, iPad and Android Devices! Understand concepts with our picture cards (over 80 pictures). No longer carry heavy flashcards in your back pack. Boost your score while shaving days off your study time. Receive free unlimited updates. Guaranteed to Pass or double your money back! Access over 2300 digital flashcards focused for the NBDE and your dental school exams on Operative, anytime anywhere with convenience and accessibility on your iPhone, iPod, iPad and Android Devices! Understand concepts with our picture cards (over 320 pictures). No longer carry heavy flashcards in your back pack. Boost your score while shaving days off your study time. Receive free unlimited updates. Guaranteed to Pass or double your money back! Access over 3100 digital flashcards focused for the NBDE and your dental school exams on Oral Diagnosis, anytime anywhere with convenience and accessibility on your iPhone, iPod, iPad and Android Devices! Access over 850 digital flashcards focused for the NBDE and your dental school exams on Orthodontics, anytime anywhere with convenience and accessibility on your iPhone, iPod, iPad and Android Devices! Access over 3800 digital flashcards focused for the NBDE and your dental school exams on Pediatrics, anytime anywhere with convenience and accessibility on your iPhone, iPod, iPad and Android Devices! Understand concepts with our picture cards (over 360 pictures). No longer carry heavy flashcards in your back pack. Boost your score while shaving days off your study time. Receive free unlimited updates. Guaranteed to Pass or double your money back! Access over 1100 digital flashcards focused for the NBDE and your dental school exams on Periodontics, anytime anywhere with convenience and accessibility on your iPhone, iPod, iPad and Android Devices! Access over 3300 digital flashcards focused for the NBDE and your dental school exams on Pharmacology, anytime anywhere with convenience and accessibility on your iPhone, iPod, iPad and Android Devices! Understand concepts with our picture cards (over 240 pictures). No longer carry heavy flashcards in your back pack. Boost your score while shaving days off your study time. Receive free unlimited updates. Guaranteed to Pass or double your money back! 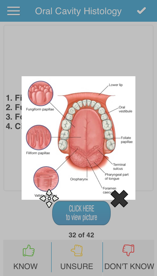 Access over 3700 digital flashcards focused for the NBDE and your dental school exams on Prosthodontics, anytime anywhere with convenience and accessibility on your iPhone, iPod, iPad and Android Devices! Understand concepts with our picture cards (over 230 pictures). No longer carry heavy flashcards in your back pack. Boost your score while shaving days off your study time. Receive free unlimited updates. Guaranteed to Pass or double your money back! Obtain app apps consisting of 23,000+ digital flashcards focused for the NBDE and your dental school exams on all subjects tested on the NBDE Part 2, anytime anywhere with convenience and accessibility on your iPhone, iPod, iPad and Android Devices! Understand concepts with our picture cards (over 2,200 pictures). No longer carry heavy flashcards in your back pack. Boost your score while shaving days off your study time. Receive free unlimited updates. Guaranteed to Pass or double your money back! Access over 2800 digital flashcards focused for the Advanced Dental Admission Test (ADAT Exam) and your dental school exams on Anatomy & Histology, anytime anywhere with convenience and accessibility on your iPhone, iPod, iPad and Android Devices! Access over 2200 digital flashcards focused for the Advanced Dental Admission Test (ADAT Exam) and your dental school exams on Biochemistry & Physiology, anytime anywhere with convenience and accessibility on your iPhone, iPod, iPad and Android Devices! 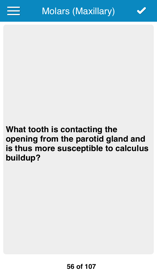 Access over 1500 digital flashcards focused for the Advanced Dental Admission Test (ADAT Exam) and your dental school exams on Dental Anatomy & Occlusion, anytime anywhere with convenience and accessibility on your iPhone, iPod, iPad and Android Devices! Access over 4100 digital flashcards focused for the Advanced Dental Admission Test (ADAT Exam) and your dental school exams on Microbiology & Pathology, anytime anywhere with convenience and accessibility on your iPhone, iPod, iPad and Android Devices! Access over 700 digital flashcards focused for the Advanced Dental Admission Test (ADAT Exam) and your dental school exams on Behavioral Science, anytime anywhere with convenience and accessibility on your iPhone, iPod, iPad and Android Devices! Access over 900 digital flashcards focused for the Advanced Dental Admission Test (ADAT Exam) and your dental school exams on Dental Health, anytime anywhere with convenience and accessibility on your iPhone, iPod, iPad and Android Devices! Access over 4700 digital flashcards focused for the Advanced Dental Admission Test (ADAT Exam) and your dental school exams on Endodontics, anytime anywhere with convenience and accessibility on your iPhone, iPod, iPad and Android Devices! Access over 1000 digital flashcards focused for the Advanced Dental Admission Test (ADAT Exam) and your dental school exams on Oral Surgery, anytime anywhere with convenience and accessibility on your iPhone, iPod, iPad and Android Devices! Access over 2300 digital flashcards focused for the Advanced Dental Admission Test (ADAT Exam) and your dental school exams on Operative, anytime anywhere with convenience and accessibility on your iPhone, iPod, iPad and Android Devices! Access over 3100 digital flashcards focused for the Advanced Dental Admission Test (ADAT Exam) and your dental school exams on Oral Diagnosis, anytime anywhere with convenience and accessibility on your iPhone, iPod, iPad and Android Devices! Access over 850 digital flashcards focused for the Advanced Dental Admission Test (ADAT Exam) and your dental school exams on Orthodontics, anytime anywhere with convenience and accessibility on your iPhone, iPod, iPad and Android Devices! Access over 3800 digital flashcards focused for the Advanced Dental Admission Test (ADAT Exam) and your dental school exams on Pediatrics, anytime anywhere with convenience and accessibility on your iPhone, iPod, iPad and Android Devices! Access over 1100 digital flashcards focused for the Advanced Dental Admission Test (ADAT Exam) and your dental school exams on Periodontics, anytime anywhere with convenience and accessibility on your iPhone, iPod, iPad and Android Devices! Access over 3300 digital flashcards focused for the Advanced Dental Admission Test (ADAT Exam) and your dental school exams on Pharmacology, anytime anywhere with convenience and accessibility on your iPhone, iPod, iPad and Android Devices! Access over 3700 digital flashcards focused for the Advanced Dental Admission Test (ADAT Exam) and your dental school exams on Prosthodontics, anytime anywhere with convenience and accessibility on your iPhone, iPod, iPad and Android Devices! Access over 2800 digital flashcards focused for the USMLE and your dental school exams on Anatomic Sciences & Histology, anytime anywhere with convenience and accessibility on your iPhone, iPod, iPad and Android Devices! Access over 2200 digital flashcards focused for the USMLE and your dental school exams on Biochemistry & Physiology, anytime anywhere with convenience and accessibility on your iPhone, iPod, iPad and Android Devices! Access over 4100 digital flashcards focused for the USMLE and your dental school exams on Microbiology & Pathology, anytime anywhere with convenience and accessibility on your iPhone, iPod, iPad and Android Devices! Obtain all three apps consisting of 10,000+ digital flashcards focused for the NBDE and your dental school exams on all subjects tested on the NBDE Part 2, anytime anywhere with convenience and accessibility on your iPhone, iPod, iPad and Android Devices! Understand concepts with our picture cards (over 800 pictures). No longer carry heavy flashcards in your back pack. Boost your score while shaving days off your study time. Receive free unlimited updates. Guaranteed to Pass or double your money back! Access over 2800 digital flashcards focused for the COMLEX and your medical school exams on Anatomic Sciences & Histology, anytime anywhere with convenience and accessibility on your iPhone, iPod, iPad and Android Devices! Access over 2200 digital flashcards focused for the COMLEX and your medical school exams on Biochemistry & Physiology, anytime anywhere with convenience and accessibility on your iPhone, iPod, iPad and Android Devices! Access over 4100 digital flashcards focused for the COMLEX and your medical school exams on Microbiology & Pathology, anytime anywhere with convenience and accessibility on your iPhone, iPod, iPad and Android Devices! Obtain all three apps consisting of nearly 10,000 digital flashcards focused for the COMLEX and your medical exams on all subjects tested on the COMLEX, anytime anywhere with convenience and accessibility on your iPhone, iPod, iPad and Android Devices! Access over 2200 digital flashcards focused for the MCAT Biological Section and your Biology, Biochemistry & Physiology courses and exams, anytime anywhere with convenience and accessibility on your iPhone, iPod, iPad and Android Devices! Understand concepts with our picture cards (over 200 pictures). No longer carry heavy flashcards in your back pack. Boost your score while shaving days off your study time. Receive free unlimited updates. Access over 680 digital flashcards focused for the MCAT Chemical Section and your pre-med general chemistry courses and exams, anytime anywhere with convenience and accessibility on your iPhone, iPod, iPad and Android Devices! Understand concepts with our picture cards (over 150 pictures). No longer carry heavy flashcards in your back pack. Boost your score while shaving days off your study time. Receive free unlimited updates. Access over 825 digital flashcards focused for the MCAT Organic Chemistry and your pre-med organic chemistry courses and exams, anytime anywhere with convenience and accessibility on your iPhone, iPod, iPad and Android Devices! Understand concepts with our picture cards (over 300 pictures). No longer carry heavy flashcards in your back pack. Boost your score while shaving days off your study time. Receive free unlimited updates. Obtain all three apps consisting of nearly 3,700 digital flashcards focused for the MCAT and your pre-medical exams on all subjects tested on the MCAT, anytime anywhere with convenience and accessibility on your iPhone, iPod, iPad and Android Devices! 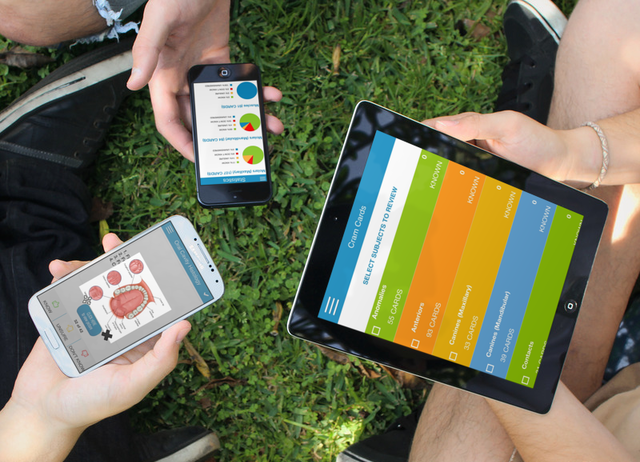 Access over 2300 digital flashcards focused for the DAT and your biology school exams, anytime anywhere with convenience and accessibility on your iPhone, iPod, iPad and Android Devices! Understand concepts with our picture cards (over 100 pictures). No longer carry heavy flashcards in your back pack. Boost your score while shaving days off your study time. Receive free unlimited updates. Guaranteed to score 16 or higher on Biology section of the Dental Admission Test or double your money back! Access over 680 digital flashcards focused for the DAT and your general chemistry exams, anytime anywhere with convenience and accessibility on your iPhone, iPod, iPad and Android Devices! Understand concepts with our picture cards (over 150 pictures). No longer carry heavy flashcards in your back pack. Boost your score while shaving days off your study time. Receive free unlimited updates. Guaranteed to score 16 or higher on the General Chemistry section of the Dental Admission Test or double your money back! Access over 825 digital flashcards focused for the DAT and your general chemistry exams, anytime anywhere with convenience and accessibility on your iPhone, iPod, iPad and Android Devices! Understand concepts with our picture cards (over 300 pictures). No longer carry heavy flashcards in your back pack. Boost your score while shaving days off your study time. Receive free unlimited updates. Guaranteed to score 16 or higher on Organic Chemistry section of the Dental Admission Test or double your money back! Access over 180 digital flashcards focused for the DAT and your math exams, anytime anywhere with convenience and accessibility on your iPhone, iPod, iPad and Android Devices! Understand concepts with our picture cards (over 180 pictures). No longer carry heavy flashcards in your back pack. Boost your score while shaving days off your study time. Receive free unlimited updates. Guaranteed to score 16 or higher on Biology section of the Dental Admission Test or double your money back! Access over 2300 digital flashcards focused for the OAT and your biology school exams, anytime anywhere with convenience and accessibility on your iPhone, iPod, iPad and Android Devices! Understand concepts with our picture cards (over 100 pictures). No longer carry heavy flashcards in your back pack. Boost your score while shaving days off your study time. Receive free unlimited updates. Access over 680 digital flashcards focused for the OAT and your general chemistry exams, anytime anywhere with convenience and accessibility on your iPhone, iPod, iPad and Android Devices! Access over 825 digital flashcards focused for the OAT and your organic chemistry exams, anytime anywhere with convenience and accessibility on your iPhone, iPod, iPad and Android Devices! Access over 180 digital flashcards focused for the OAT and your math exams, anytime anywhere with convenience and accessibility on your iPhone, iPod, iPad and Android Devices! Understand concepts with our picture cards (over 180 pictures). No longer carry heavy flashcards in your back pack. Boost your score while shaving days off your study time. Receive free unlimited updates. Access over 2300 digital flashcards focused for the PCAT and your biology school exams, anytime anywhere with convenience and accessibility on your iPhone, iPod, iPad and Android Devices! Access over 680 digital flashcards focused for the PCAT and your general chemistry exams, anytime anywhere with convenience and accessibility on your iPhone, iPod, iPad and Android Devices! Access over 825 digital flashcards focused for the PCAT and your organic chemistry exams, anytime anywhere with convenience and accessibility on your iPhone, iPod, iPad and Android Devices! Access over 180 digital flashcards focused for the PCAT and your math exams, anytime anywhere with convenience and accessibility on your iPhone, iPod, iPad and Android Devices! What our Cram Card users say? Cram Cards App is amazing! Not only is the less expensive option to prepare for the NBDE, the quality of its content, lifetime access of the material make it an ideal NBDE prep. This app is absolutely stellar. It has helped me with dental school classes and makes it so much easier to study for my exams on the go. Love it! I absolutely love your app, it really is helpful to study for my upcoming dental board exam at my convenience. I've been using this app in conjunction with First Aid, Dental Decks, Crack the NBDE and old released NBDE practice exams. Useful and rather accurate information containing nuggets of information which may show up on the NBDE. Your search and filter feature is awesome in that it finds flashcards with certain keywords so I can focus on them. I've found myself also using Cram Cards to prepare for my dental school classes. I've installed your Cram Cards on both my iPhone and iPad's and this handy app has been such a fun way to study for my exams! I am memorizing NBDE concepts better than ever already. Excellent product. Loved the app. Interface is very simple and clean. This app saved me a LOT of time that I would have wasted on making my own cards. I was a beta-tester for this app and found it to be an excellent resource to prepare me for my NBDE. 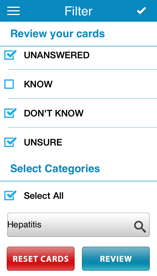 Does Cram Cards work on my iPhone, iPod, iPad and Android devices? Works on all iPhone, iPod, iPad and Android devices! How can Cram Cards be purchased and what are the costs? 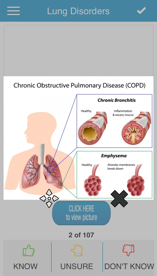 It can be downloaded from the Apple App Store or Google Play for less than other preparation courses or flashcards cost. Cram Cards is on promotion for $10 which is 2 cappuccinos, or a 7 minute taxi ride or 1 deli sandwich! Cram Cards is super affordable! How can I download Cram Cards onto both iPhone, iPod and iPad? To download previously purchased content, use your device and tap on the "App Store" icon. Make sure you're signed in with the same Apple ID used for the original purchase. Tap "Updates" from the bottom dock and click on "Purchased" on the resulting screen. Locate the app in your Purchased tab and tap the download icon. The app will begin downloading. 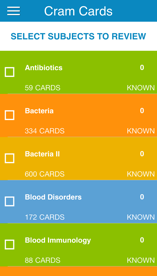 Cards are organized into separate categories. 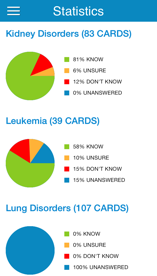 Mark the category you would like to focus on and click on Start to review flashcards. How do I assign a status to a card? To flip the flashcard to the back, tap on the card. On the back of the flashcard, you can mark it with KNOW, UNSURE, DON'T KNOW. Your markings for each card will be remembered so you can keep track of what you know and don't know and review later on. How do I review my cards? Click on the Menu bar from the top left to access "Filters". Here you can choose which cards to focus on and which categories. You also have an option to only pull up cards with a certain keyword. I accidentally deleted the app, how do I get it back? Follow the same instructions in the answer to the above question. Why can't I download Cram Cards on my Android? Exclusive to the iPhone at the moment. We're starting work on the Android app soon. I had a problem with the app? A lot of issues are easily resolved by simply restarting your iPhone, iPod, iPad or Android device. If restarting doesn't help, try deleting Cram Cards, then install it again. If you have any questions, you can always email us! Please leave us positive reviews to support us! Support us with a 5 Star review so we can sustain free updates. Click here for instructions. Simply contact us and we'll add it to our bucket list of features to incorporate and release for free! How can I apply for a job at Cram Cards? Cram Cards has really made it easy to join our team. Just contact us.